ASCE has honored Carl Haas, Ph.D., P.E., F.ASCE, with the 2019 Computing in Civil Engineering Award for leading advances in computational models and methods in 3D scan-to-BIM and scan-vs-BIM, construction object locating and tracking, data fusion, infrastructure computer vision, and more recently in industry process workflow, project risk, and system dynamics models. Haas is an internationally recognized expert who has made many impactful contributions to computing in civil engineering. His research has focused on the integration of computer-based automated technology and robotics to enhance construction and infrastructure management. His research into robotic systems, integrated with his expertise in data fusion and processing algorithms, has produced a cohesive breadth of work related to real-time sensing, site modeling, and transportation asset and system state estimation. Haas has also advised many students in his positions at the University of Texas at Austin and the University of Waterloo. He has served the community in many roles, including service to the ASCE Computing Division and ASCE Construction Institute. 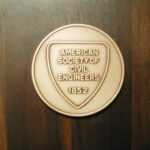 The Computing in Civil Engineering Award recognizes outstanding achievement and contribution in the use of computers in the practice of civil engineering.